In this blog we are going to explore disability equality training, what it is, what the benefits are of utilising it and how it can help your disabled colleagues, employees and customers. Disability equality training is designed to ensure that staff within organisations are able to feel comfortable when supporting customers and colleagues who have disabilities. The training aims to provide staff with the skills, tools and practical know how. Disability Equality Training is led by people who have disabilities, who are able to share their personal insight and experience, making the training authentic. The training is designed to ensure that services are accessible physically whilst challenging and removing attitudinal barriers. Our hands on approach supports organisations to understand and implement practical and effective solutions. All of our trainers have disabilities and for some training providers this is as far as they go. Here at Centre for Resolution we pride ourselves on not only having lived experience but professional expertise in the world of disability and business. They bring realism to the training with their first hand experience where they are able to give you their honest view of services and how they could be improved. On the course we utilise scenarios, open discussion, case studies, videos, group work, myth busting, challenging thoughts, and much much more. Our trainers are very open to any questions you may have. They ensure that the training is non-judgmental, confidential and transparent and no question or thought is off limits. There are many benefits to utilising disability equality training for your organisation. As well as a legal obligation there is also a moral obligation from organisations and service providers to ensure people with disabilities are not excluded from using the service or from being employed. 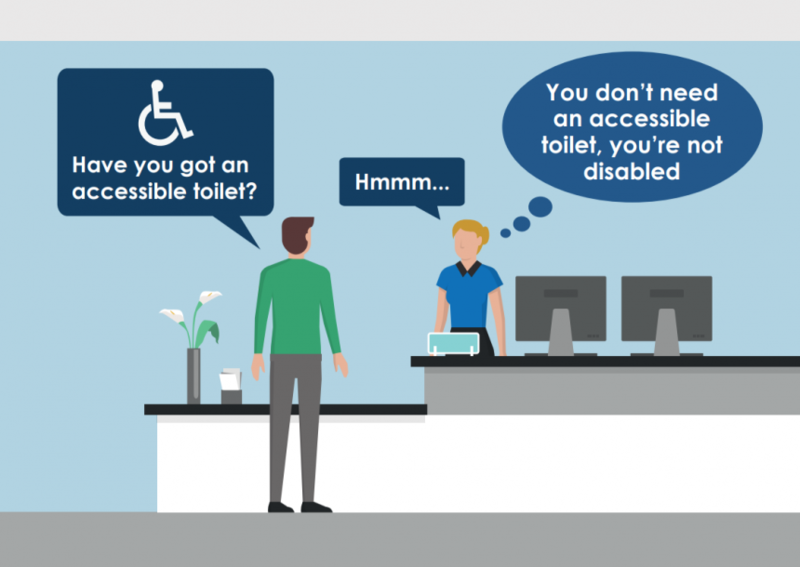 There is a massive case for businesses to use disability equality training. Not only does it provide good customer service for your customers it also gives your staff the tools and knowledge to be able to support those who have disabilities. There is also the Purple Pound, which you probably haven’t heard of before. The purple pound is the amount of money in which disabled people spend per year in the UK, and it amounts to over £250 billion pounds per year. Not to mention that customers with disabilities are extremely loyal. When they find a service/product they like they tend to come back again and again. It is also more than likely that not only will the disabled customer use your services but their friends and family too. On the flip side people with disabilities share their negative experiences of inaccessible services or products, which spreads like wildfire in the disabled community. So there is definitely a business case to utilise training services to ensure you as a service or workplace are inclusive of people with disabilities. Organisations who have previously used disability equality training or our disability workshops and have made improvements to their service have seen massive benefits for the customers. Customers have reacted in a very positive way in terms of accessibility of the service they receive. We understand that every business is different so our training can be tailored to suit your specific requirements. For more information about our in house courses please visit our fees page. We can also deliver open courses. This is perfect for organisations who wish to send a small amount of people on our courses or for sole practitioners, consultants or professionals who wish to understand more about disability. We also provide disability workshops, consultancy and disability at work coaching. If you wish to read more please visit our disability page. If you would like to know more information about our disability equality training or disability workshops you can call our office on 01905 21717 or email info@centreforresolution.co.uk.